Lygia holidays take you to the east coast of Lefkas, five kilometres south of Lefkas Town. It is a small fishing village where the pace of life is slow. Holidays in Lygia are popular with those seeking complete relaxation. 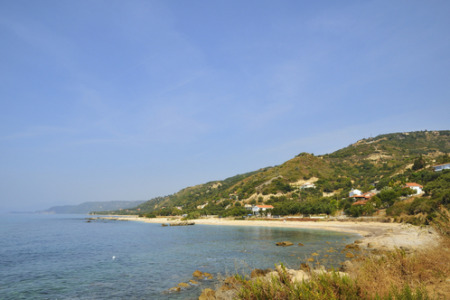 There are small shingle coves and beaches that are gently lapped by the sparkling Ionian Sea and which offer safe bathing for children and less confident swimmers. Holidays to Lygia can be taken from April to October when the temperature rises from twenty to thirty degrees. Early and late season are popular with walkers who wish to avoid the heat in high season. We have a number of cheap Lygia holidays which are considered great value for money as quality and service are never compromised. With good accommodation and friendly tavernas serving traditional fare, our low cost Lygia holidays promise an authentic Greek experience. Evenings are as relaxed as the days reflecting the resort's popularity with families and couples. So, if you are looking for a haven of peace in pretty surroundings, take a look at our Lygia holiday deals and you may find one that suits. For further information and to discover our latest Lygia holiday offers, please use the search facility.